I moved down to this park for long term. When I met the site manager, he acted like I was going to kill him or rip him off the first time I ever met him, even though he knew I was coming down there later in the day because I worked nights. Once I got moved in, they put me into the overflow/overnight parking first, even though I told them I was going to do month to month, long term, long before ever moving there. I had to move less than two weeks later to a month to month site. I do believe this site was already available, because I walked the whole park the first day I was there, and it was open. They still forced me to move, even though I was ok where I was, even with the rain causing a flood in the space I was in. I moved the same day, and when I got to my new space, I found out I had no access to the parks Wi-Fi. I contacted the lady who was working that day, very nice lady, she attempted to get the system working, stating she had never had anyone complain of issues in the new spot before. This went on all day, no access at all, had decent streaming access at old site. They refused to allow me to move back, even made sure they put another long term in the site I was at previously... She was able to get the IT Tech they use to speak with me. Now, as I was a former IT Tech myself, I attempted to find out why the service was so bad there. He attempted to blame my equipment, which I officially told him he was wrong about, and finally got him to admit it was the bad equipment the management and owner of the park installed, and that he doubted they would actually fix it, because it costs money to do so. I attempted to get this fixed for a few days, even asked if they would give a partial credit since the services provided for month to month included accessible Wi-Fi, and I wasn't getting it, and the site manager stated no way. I asked if I could get alternative Wi-Fi, he said yes, as long as nothing permanent was installed on the property, period. I spoke with another long term resident, he advised me of a few options to get it, and I proceeded to get installers scheduled. One company came out, and attempted to get my RV hooked up, and stated that the trees all around the park were blocking the connection. The installer recommended moving to another spot with clear line of site. I went into the office, spoke with the site manager once again, and asked if there was another long term site I could move to, to get internet. He told me that they really didn't have any more sites, I was stuck in the site I was in. I called him on this, he finally admitted he had 2 sites available, but, that the owner would not allow my smaller RV to move to one of the larger sites. Let me give you a bit of information about where I was moved to, it was a spot near the fence, just enough room to park my RV and no where to park my vehicle. When I asked about it, I was told I could use one of the other spots nearby to park my vehicle. So in essence, I was using up 2 RV sites instead of one. The site I attempted to move to, which would have had clear site for the install, was a single 50'+ site, my vehicle could have parked there in the same site with my RV, and not caused any further issues. I would have been ok, even though the site was MUCH closer to the freeway exit, which was busy all the time, and yes, as close as it was to the site I tried to get to, you could definitely hear/feel the heavy trucks that used the exit, quite quite easily. I attempted to get into that site. The site manager said he would ask the owner, but, doubted he would allow me to move. I asked him to please check. I didn't hear back from him about it. However, the next day, I received a lovely envelope taped to my RV door. They didn't even knock. Yes, someone was at residence when it was attached to my door. I opened it, thinking maybe I had a reply to the new site. Imagine my surprise to find a notice of termination of lease, without cause, and I was to be out within 30 days. I went into the office the next day, and spoke with the site manager. He refused to state why at first, I was being essentially evicted, yet not evicted. Once we got around his reluctance to admit why, as he finally got mad enough to really tell me why this was happening... He stated I was causing too many waves, and that the owner decided he didn't want me there anymore, and so got a hold of his property manager, and told him to give me notice to vacate. Now, let me state for the record, I never spoke with anyone else in the RV park, except employees, about this issue, other than asking one person where they got their internet from because I was having connection issues, and was advised where to get alternate services. I advised the site manager I would accept this patently unhinged reaction and would definitely move out by the date demanded. He said good. I did advise him that I would not leave a good review of the site, he said that the owner didn't care about reviews, or me. I left the store they have at the park, and went back to my trailer. I learned that the site manager either lives, or spends most of his time, above the store, and that ever since I received the notice, he was up there a lot, watching me everytime I left my RV. I considered actually contacting the police for possible stalking charges, but, instead, found a better location to move to, and left this location as fast as humanly possible. The date I left, I went in to see if I could get a partial refund, as you do pay in advance. Thankfully, it was the lady in there, and not the idiot who is the site manager. She was finally able to get my refund done, however, there was a note on my file/lease that was terminated by the owner, that if I had stayed the full duration, to make sure I was charged for the extra days I would have stayed past the first of the month. I am so thankful I left, I truly believe I will never, even if I have to dry camp, ever, use that park again unless it is bought out by someone with half a brain, and they fire the site manager. The campground is nothing fancy. I agree with the other reviews Basic gravel parking lot with a bit of a grass strip here and there. The staff ls friendly. It is good for the one night lay over while driving I-5. The hookups for electric & water worked out, but the sewer was at the head end of the space. I could no way reach it from the back of my rig. I noticed others had the same problem, it is as if the staff had the first rig in the row pulled in the wrong direction and all others followed suit. A very clean park with friendly staff - site was level with a grassy yard. 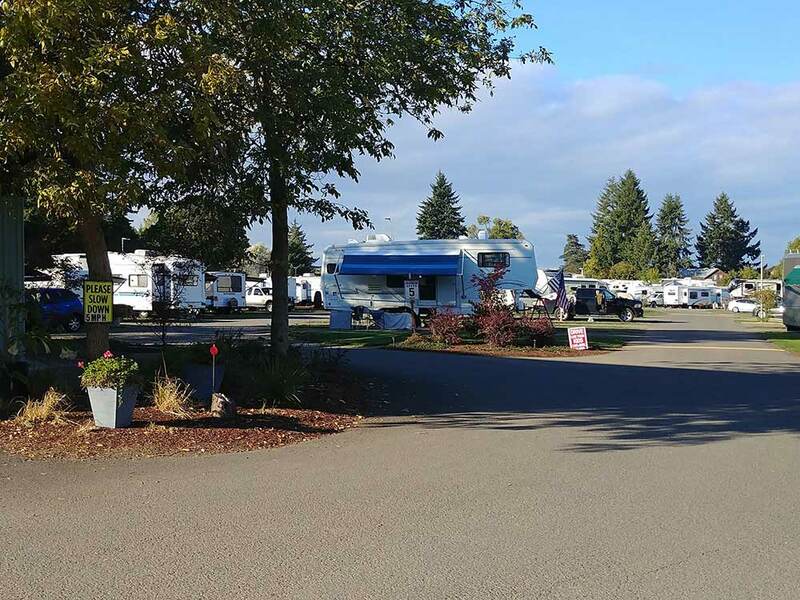 Restroom and shower facilities were spotless, I noticed a cleaning crew showed up every afternoon, a rarity to see at an RV park. Nice on site laundry room, and even a convenience store stocking local wines and microbrewed beers as well as popular snacks and frozen meals. Will be back for sure! This is basically a fine place, nothing fancy, does what it needs to do. Nice and convenient off the highway and is clean, altho highway noise can be heard, nothing too terrible. Has gas stations and little convenience stores and a couple small places to eat. Please note the city of Creswell does not have a grocery store so dont look for one. I asked a local to make sure when I couldnt find one. Management was polite and courteous. Nothing fancy but clean and neat. Easy to maneuver in the park. Next to Interstate 5 but noise not too bad. Easy access from Interstate. Utilities very good. Gas station with diesel and propane plus a convenience store across street from rv park. Walk across street also to eat at TJ's Restaurant which is very nice with good food and a nice lounge bar in the back. Great place for a short stopover when traveling through this area. Nearby Hobby Field hosts a sky diving company and flight school. Tee off at the course the University of Oregon Golf Team calls home. Feel the softness of Alpaca wool sweaters and socks on your visit to an Alpaca Farm.